With so many Japanese language resources out there, it’s hard to know where to turn to for your learning needs. I’ve collected a number of useful resources and sorted them by level for your convenience. If you want to recommend a resource that you don’t see here, let me know. If you’re looking for some durable, high-quality flash cards to begin your Japanese learning adventure, look no further. 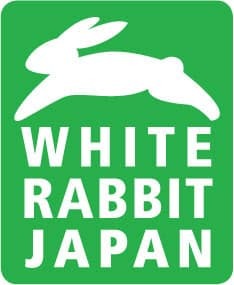 White Rabbit Press recently did a full revamp of the illustrations and verbal mnemonics to better match how native Japanese speakers would say each sound, and you also get access to a free audio pronunciation guide. 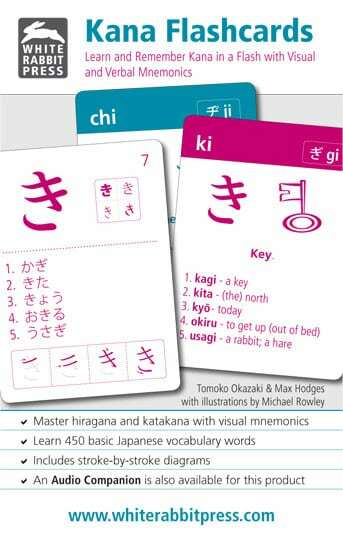 In addition, the cards will introduce you to 450 basic vocabulary words and provide stroke-by-stroke diagrams of each hiragana and katakana character. Oh, the nostalgia! While Genki is not without its critics, it’s still among the best options for a textbook. In the early stages, having a textbook to help guide you along can be majorly beneficial, especially for those who do not have access to a classroom. Make sure to pick up the workbook for the extra practice, and try your hand at shadowing along with the audio scripts included on the CD. It’s called “The Yellow Bible” for a reason. At 600+ pages, this thing is a beast, filled to the brim with detailed explanations and examples (and explanations of examples!) that span approximately 200 basic grammatical expressions. Not only is it a great reference book, but learners can also benefit from a traditional cover to cover reading. While this is only the first book in the series, its contents will take you well into the intermediate stage. Anyone who can demonstrate mastery of all the grammar found in this book can rest well knowing they have a comfortable grasp of Japanese. Genki II picks up where the first book left off, offering much of the same style. My advice: If you finished Genki I and enjoyed it, go ahead and pick up its successor. In addition to even more Mary and Takeshi drama, the book covers a wide variety of topics and will aid you in your transition to the intermediate level. As with Genki I, you’ll want to pick up the workbook , too. With the second entry of this popular series clocking in at a whopping 700+ pages, authors Seiichi Makino and Michio Tsutsui do not fail to impress. (Seriously, I’m shocked at how much content they were able to jam into these books.) 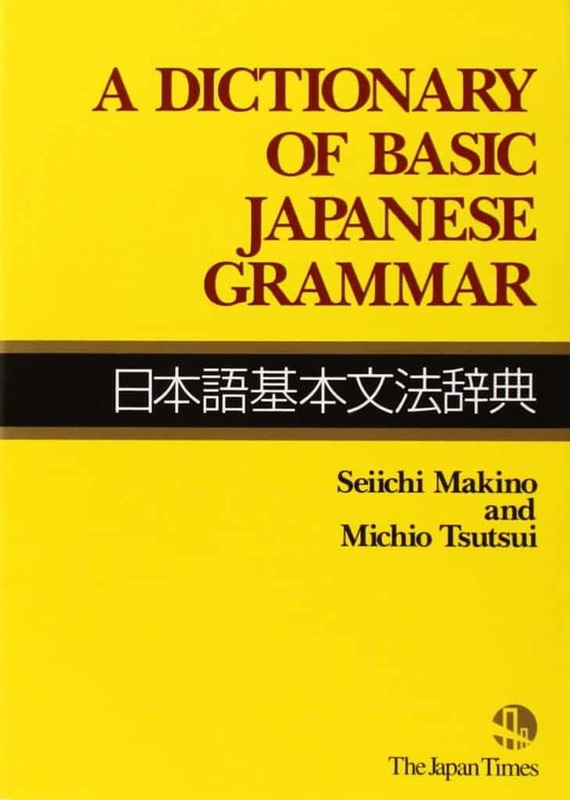 This book covers roughly 200 of the most important grammatical structures any serious intermediate Japanese learner should know. If you couldn’t find a particular grammar in the Basic Dictionary, chances are good that you’ll find it in here. Completing Genki II leaves you with some pretty decent Japanese skills, but it’s also at this point where most learners start to realize they’ve only scratched the surface. You find yourself at a crossroads: Do you make the jump from intermediate to advanced Japanese? If so, Tobira will help you bridge that gap. Unlike Genki, Tobira does not hold your hand. You cover enough material to bridge the gap between N3 and N2, if we’re talking in terms of JLPT levels. That’s a lot of content. The good news is that Tobira’s topics of study are generally more interesting than Genki’s. You can finally start talking about real issues like technology, religion, the education system, and history, all from a Japanese perspective. You’re also able to go beyond the textbook thanks to the way it integrates multimedia content into lessons. It’s a serious textbook that will give you serious results if you commit. I’m not one for sensationalism, but this book is truly not for the faint of heart. It goes well above and beyond what most Japanese learners need to know, but if you’re a huge grammar nerd or are studying for the JLPT N1, this book is a boon. These are resources that every Japanese learner can benefit from using, no matter their level. Chock full of model sentences that let you see the word or phrase you’re looking for in context. While it usually gets the job done, it doesn’t differentiate between written and spoken language, and like all resources, it’s not 100% perfect. Some native speakers I’ve talked to said that some of the sentences it contains are unnatural. Still, when you find yourself needing to translate something from English to Japanese, where many other dictionaries would leave you sratching your head wondering which Japanese word is the right one to use, ALC will often steer you in the right direction (and you can always consult with a native speaker later). Anki, how do I love thee? Let me count the ways. Anki is a wonderful flash card app with a not-so-wonderful interface. It’s not easy on the eyes and doesn’t provide the smoothest user experience out there, but it’s what’s under the hood that counts! Open source and boasting the best price tag of all, Anki is totally customizable and you can even download flash card decks shared by others in the community–anything from JLPT kanji decks to Genki vocabulary reviews. People use it to study geography, memorize students’ names, learn multiple languages, you name it. If you’re looking to pinch pennies in your studies, this will be a mainstay in your toolbox–that is, unless you want to download the app for iOS, in which case you have to fork over $25(!?). The Android version and desktop versions are free. If you’re looking for a good dictionary, your search ends here. This thing is an absolute monster. The server has a number of Sanseido (a widely respected, hundred year-old Japanese publishing company known for publishing dictionaries and textbooks) dictionaries available, including the massive 大辞林国語 daijirin kokugo (Japanese > Japanese), the Exceed EJ and JE dictionaries, Chinese <> Japanese, technical terms, trivia, quasi-synonyms (words that have similar meanings but are not interchangeable), and tons of example sentences to boot. It’s also blazing fast. Everything is in Japanese, so you may not really get the most out of this tool until later in your studies, but learners should strive to get away from English translations as soon as possible anyway. The sooner you can start using Japanese to learn Japanese, the better. I may be biased, but iKnow! is my go-to recommendation for people who want a dependable flash card app. iKnow! is a paid service that slaps a pleasant interface and seamless user experience over essentially the same Core 2k / 6k decks you can find in Anki for free. Each flash card comes with audio featuring native speakers and pictures. There are checkpoints and quizzes along the way to assess what you’ve learned, as well as a useful progress tracker that employs the typical gamification strategies (badges, study streaks, etc.) in order to help keep you motivated. The key to using iKnow! effectively is to take full advantage of the multimedia flash cards. Shadowing native speakers multiple times across thousands of flash cards will do wonders for your pronunciation and pitch intonation. (Seriously, it will set you apart from the rest of the crowd.) It also goes beyond the typical flash card format: There are multiple question types, the most important of which being the kind that requires you to spell the answer out. This will do wonders for your vocabulary retention. You can test your listening skills by looking away or closing your eyes when you encounter a new flash card, and you get some kanji reading practice as an added benefit. At the end of the day, you just have to ask yourself if it’s worth the few extra bucks per month. For me, it definitely was. 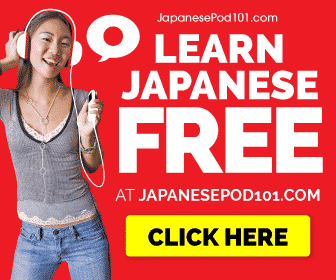 JapanesePod101 was one of the first resources I used to learn Japanese, and it’s one of the reasons I enjoyed being a beginner so much. I think it’s because I agree with their learning philosophy: “The ultimate purpose of language learning is communication, and topics like grammar and vocabulary are only aids to this ultimate goal.” It focuses on conversational language that ranges from super casual to super formal, covering a wide variety of topics and sprinkling in some cultural tidbits along the way. Some of the scripts and characters are a little cheesy, yeah, but there’s just so much darn content that it’s hard to knock it. They have various learning paths for learners with specific goals in mind, video lessons, audio scripts, comprehension quizzes, JLPT study lists, and a nice dashboard to keep it all organized. Check out the free trial to see if it’s right for you and check out their coupon page; they’re often running some kind of discount at any given time. To top it all off, they have a pretty generous 60-day money back guarantee. Ah, Jisho. It’s a solid tool with some handy features. I still have it sitting in my bookmarks toolbar, and let me tell you, that button has gotten a workout over the years. It’s great for quick and dirty J > E translations, but pretty unreliable for E > J.
KiC is a great resource for intermediate and advanced learners. The series covers 2,136 kanji–the standardized 常用 jōyō kanji–and about 9,500 vocabulary words geared toward the needs and interests of adult learners. The first volume covers the first 1200 kanji while the second covers the rest. (Make sure you get the revised edition that was published in 2013, as all editions before that contain the old jōyō list of 1,945 kanji.) As the name suggests, the books do a good job of presenting the kanji in, well, context. Kanji and vocab are intertwined and should be studied together, which is what makes these books great. There’s plenty of context to be found, including common phrases, word/phrase pairings (such as synonyms and antonyms), and tons of example sentences. It’s not a drill-style text; there are no fill-in-the-blank or multiple choice problems like those found in other books. Rather, it is up to you to create your own method of study. You can go through the book and test yourself by simply reading through it, but I personally recommend making flash cards out of the books. It’s a massive endeavor (my deck’s final count ended up at 5,000+ cards, all hand-typed), but you will learn a lot along the way. Sadly, the books can be somewhat of a hassle to track down if you live outside of Japan, and they don’t come cheap (~$100 for the set). Still, I have to recommend it because of the massive amount of example sentences that come with it. Great resource for self-learners who want to take their kanji study seriously. If you’re gunning for the JLPT, it’s hard to go wrong with this book series. Levels range all the way from N4 to N1 and entire volumes are dedicated to specific topics: grammar, kanji, vocabulary, listening, and reading. The materials are in-depth and rather drill-like in nature; think of it like a JLPT boot camp in book form. It doesn’t guarantee that you’ll pass, but it’s one of the better ways to prepare. These are extensions/add-ons that display a pop-up dictionary when you to hover over Japanese text in your web browser. It can be super helpful when you’re trying to navigate Japanese websites, but be sure to disable it when you’re doing things like drilling flash cards. 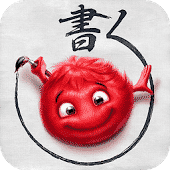 Originally built to help learners of Chinese, the scope of this kanji-writing app for iOS and Android now includes Japanese, featuring a number of textbook and other study lists. For example, the Genki and Tobira textbooks contain certain kanji which you will be expected to be able to read but not write, and some of which you will be expected to be able to read AND write. Skritter differentiates between the two, combining the power of SRS with a sleek and responsive writing interface to get you reading and writing the kanji you need to know at a high frequency. 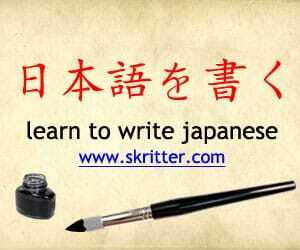 It has study lists that range from hiragana and katakana practice to JLPT N1 content, so it’s a fantastic way to keep your writing skills sharp anytime, anywhere. I especially recommend it for students who are enrolled in formal classes and are expected to hand-write Japanese often and/or have kanji writing requirements on quizzes or tests. I despise bragging, but I can’t remember a time when I didn’t get a perfect score on my kanji assessments in school, and I owe much of that to how easy Skritter makes it to study. Give the free trial a shot! This series dedicated to JLPT study differs from Kanzen Master in that it’s a little more approachable and easier to digest. There are cute illustrations and dialogues to keep the text from being too dry and the authors try to keep grammar explanations simple. In my personal experience, the material found in this series has always been slightly easier than what I’ve encountered on the JLPT, but I also have friends who passed the N1 and swear by it. It’s a great series that’s basically on par with Kanzen Master, so flip through a few pages and see which style you prefer. Most people need the extra practice to warrant getting both, anyway. Tae Kim’s guide has been around for quite some time and has proven to be a very popular learning resource that covers the basics. Considering that you can use the guide in its entirety for free, it’s worth a look for any learners on a budget. YouTube can be a great resource for learning a language–the content is free and there’s a lot of it. Below, you’ll find some Japanese language channels that dedicate themselves to explicit instruction, but I also want to use this space to showcase other channels that feature native speakers but aren’t focused on instruction. Rather, they’re typical YouTube content (e.g. video game Let’s Plays and daily vlogs), but in Japanese. Find something you like and start working on your listening chops! Here’s a collection of websites and other resources that I couldn’t find a good category for, but are useful and interesting nonetheless! This website was created by a kanji enthusiast who managed to pass Kanji Kentei (漢字検定) Level 1. Most of this kanji knowledge lies well beyond what is needed for even JLPT N1, but for those of you who are particularly interested in rare kanji, proverbs, and four-character compounds (四字熟語), this site might be of interest! Is your favorite resource missing from this list? Let me know.